Gentle Dental Seville is conveniently located on E. Chandler Heights Road near the corner of S. Highley Road, near Walgreens. We offer flexible hours including early mornings, evenings and weekends for your convenience and accept most insurance plans. For those without dental insurance, we offer a Gentle Dental Smile Plan that provides low cost preventive and diagnostic care and discounts of 20% or more on all dental treatment. We also have payment plans available as needed. Our friendly team of dental professionals is eager to put a smile on your face by providing sincere and compassionate care. We offer gentle, personalized family dentistry for patients of all ages. 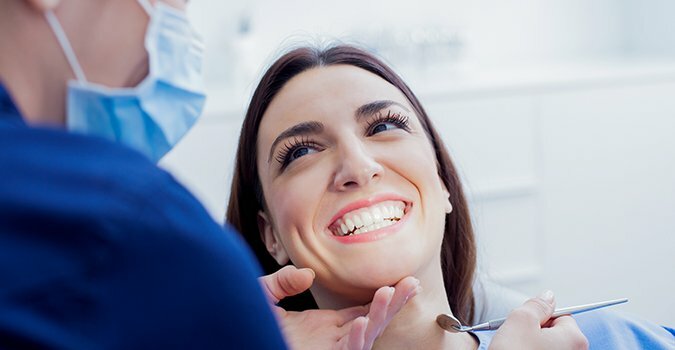 Our skilled team of dentists can help you with all types of general dentistry, orthodontics, cosmetic dentistry, dental implants, periodontics, zoom teeth whitening, and much more. We pride ourselves on building relationships for life with our patients by providing a great patient experience. We strive for open communication, service excellence for all your dental needs, and education to help maintain good oral health and overall well-being. We promise to make you feel valued, respected and as important as family. Stop in and see us on E. Chandler Heights Road. We offer convenient, handicap-accessible parking. To set up an appointment or for further assistance, please call us at 480-900-4485. One of our friendly staff members will be happy to speak with you. Dr. Richins most enjoys helping patients reach their own personal dental goals, whether that be achieving a perfect smile or simply helping their teeth to function better so they may eat a nice, juicy steak. He loves to see people happy and able to smile again! He is is a general dentist, but he appreciates all aspects of dentistry including endodontics, extractions, implants, crowns and bridge preparation and cosmetic dentistry. After graduating from Utah State University, Dr. Richins received his Dental Degree from the Herman Ostrow School of Dentistry of the University of Southern California. He always wanted to go into the medical field to be able to help people, and as he shadowed in the different fields of medicine and health, he was drawn to the dental field and enjoys it immensely. Dr. Richins and wife Candice have a Great Dane and a Redbone Coonhound. They also have many horses, cows and chickens. He loves the outdoors, being active, and enjoys keeping up with USC Trojan football games. He has always wanted to live in Arizona, and living in Arizona allows him to be close to family both in Utah and Mexico, as well as the family that lives here in the area. I had a great experience with Marleena the hygienist today. Thank you. Karen Alban Mion, we're happy you found our staff to be so supportive during your experience here at Gentle Dental Seville. When I walk in into the office I am greeted with a great smile and automatically feel comfortable. Dr, Geronimo and the staff members Jeanette, Candice, Rachel and Dental Hygienist Marina display a quality of work that reflects high professional standards. Alejandro Estrada, thank you for your kind review; we are happy to pass along your comments to the team here at Gentle Dental Seville! Came here for a second opinion and bummed that it took our family so long to find this place. The staff here are knowledgeable and friendly. Prices are fair and they are honest. Highly recommended! Hi Dana Klett, thank you for taking the time to leave a review for us at Gentle Dental Seville. We're happy we could meet your expectations! Hi Kelley Newman, thank you for taking the time to leave a review for us at Gentle Dental Seville. We're happy we could meet your expectations! The Dentist is so nice and was willing to get me a prescription for my nerves while getting any procedure completed. I had my best cleaning I've ever had for the past few years they were so complimentary and encouraging. Dear Kristen Troyer, Thank you for taking the time to post your kind words about our staff. We are excited to share this with the team. At, Gentle Dental Seville, it means a lot to us to know you had a great experience and we look forward to seeing you on your next visit. I'm a senior on a fixed income, and have been a regular and frequent client with Gentle Dental since we moved here roughly 2011. Back then, the offices were named "An Elegant Smile" (AES), and I was going to their location on 3336 E. Chandler Heights Blvd., Gilbert. The quality of service was really good, so much so that I talked my wife into changing to AES from her previous dental provider. AES rotated several fine dentists through the Gilbert office. Eventually, Dr. Sneha Subramanian became our recurring AES practitioner - we were so confident with her that, when she transferred to the AES office way over at 10 S. Kyrene Road, Chandler, we followed her there despite Kyrene being the opposite side of the East Valley. Along the way, I needed LOTS of older dental work redone, it was all performed very, very capably. Then last year Gentle Dental bought out An Elegant Smile, but Dr. Subramanian remained and the high quality of service of all staff continues. Highly recommended! Dear Michael O'Hara, Thank you for taking the time to post your kind words about our staff. We are excited to share this with the team. At, Gentle Dental Gentle Dental Seville, it means a lot to us to know you had a great experience and we look forward to seeing you on your next visit.